PBSC was established in 1987 and is a high-quality supplier of components for clean controlled environments. The company provides installation, servicing, technical advice, product selection and demonstrations. PBSC products are designed for use in pharmaceutical, healthcare, chemical and biotechnological facilities and have a 12 month warranty. The PBSC product range comprises clean room stainless steel doors, glass clean room doors, phenolic resin cleanroom doors, emergency escape panels, breakout panels, vision panels, viewing panels, transfer hatches, trolley hatches, pass thru chambers, pass boxes, decontamination showers, clean room lifting trolleys and change room furniture. PBSC’s products are now used in many pharmaceutical, medical, healthcare, food, chemical and biotechnology organisations. The patented door and frame system incorporates many features to ensure suitability for cleanroom and contamination control environments. Door sets are manufactured to suit customers’ dimensions. PBSC has a selection of specialist application doors made from stainless steel, glass, phenolic resin and powder coated steel. Gas tight doorsteps are also available with inflatable seals eliminating the need for a floor threshold. The emergency escape panels provide a quick and simple escape route for personnel from a clean room environment. Units are sealed and offer a flush, easy clean surface to the clean room facility. The standard PBSC viewing provides the clean area with a fixing free, flush, double glazed unit made from polished stainless steel. PBSC also offers a triple glazed, two hour fire rated vision panel, flush glazed with no visible fixings with a polished stainless steel frame. A new addition to the range is the PBSC integral blind system which offers a magnetically operated Venetian or blackout blind option to all three types of viewing panels. PBSC offers stainless steel, phenolic resin and PVC construction for both transfer hatches and trolley hatches, giving cost choices for all manner of projects, from chemical and hospital to cleanroom environments. The specific design of the units offers a flush interior to the hatch making it easy for clean-down procedures, with no protruding or recessed areas. Pass thru chambers are supplied with toughened plate glass doors and a mechanical interlock system to aid users in the reduction of cross contamination and pressure loss whilst passing items between “clean” and “dirty” areas. PBSC also offers a 1 hour fire rated transfer hatch of stainless steel construction, complete with stainless steel door with vision panel. The PBSC decontamination shower provides total decontamination to the operator and to the internal surfaces of the shower. Units are constructed to a modular design using standard components to the client’s specification. Units can utilise an existing site air handling system or be a standalone unit complete with its own system which can be placed next to or away from the unit itself. The system may be supplied with interlocked doors, adjustable time sequences, emergency override switches and an accessible control panel. 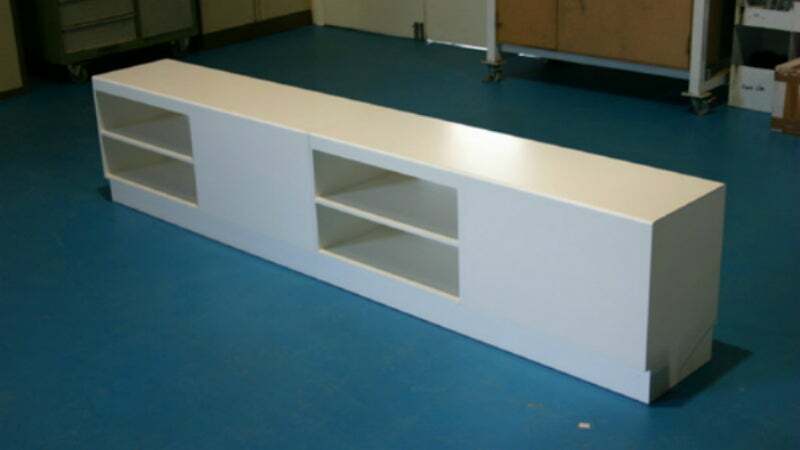 PBSC offer a range of clean room change furniture, available in phenolic resin construction or solid PVC construction. The furniture can be made to sizes to meet the client’s requirements. The high-quality lifting trolleys are designed with ergonomics, functionality and hygiene as key focuses. Our lifting trolleys are constructed from stainless steel, with minimized ledges and crevices to enable ease of cleaning. As an option our lifters are able built to be cleaned in an autoclave and a splash-proof option is also available. PBSC's ultrasonic fog shower has a number of advantages, including a lower water consumption, droplets formed are 1000 times smaller than mist droplets, and the user can add agents to enhance performance. The breadth and depth of PBSC's product offering for laboratories and cleanrooms have been significantly expanded as a result of its partnership with US-based Presray. Its product offerings complement each other brilliantly. PBSC present a wide range single and double leaf hinged blast resistant doors, as well as pre-engineered sliding doors.